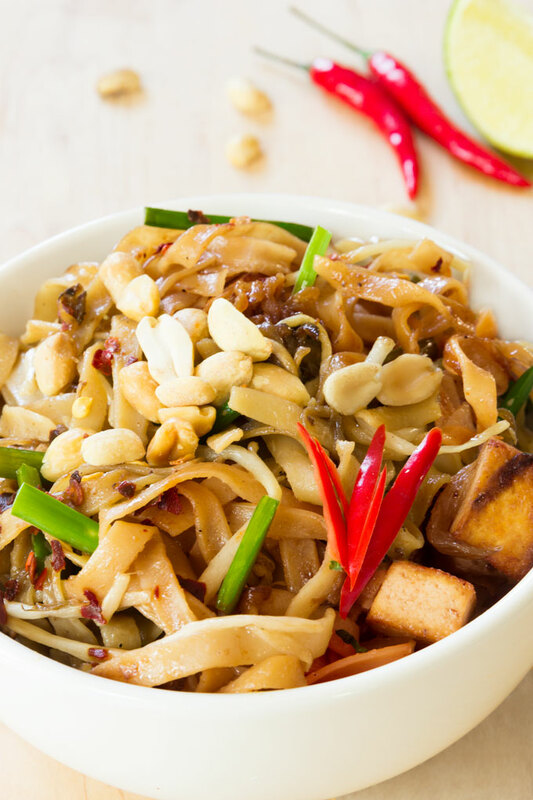 Like all Thai foods, this vegan pad Thai is all about balance. There’s the savory flavor from tofu coated in soy sauce, spiciness from the chilies, sourness from the tamarind and lime, and sweetness from the palm sugar. The crunchy peanuts then take the pad Thai to another level by providing a textural contrast to the soft noodles. It’s one of those dishes that makes you want more after every bite. I love Thai food. No, not North American Thai food. Real, authentic Thai food how you actually find it in Bangkok. The first time I tasted authentic Thai cuisine was when I moved to Canada to study at a university. I lived in a dorm and one of my roommates was Thai. Lucky for me, she loved to cook and often shared her meals with me. Her vegan pad Thai and Thai summer rolls with peanut sauce were hands down my favorite. Pad Thai is the best-known example of Thai cuisine and the ultimate street food in Thailand. According to Natty Netsuwan, the term “street food” represents nothing but quality. Food cart cooks are in a very competitive situation, with small space, ingredients and tools they need to specialize in a dish or two just to stay in business. The best of these cooks have cooked the same dish day-after-day, year-after-year, constantly perfecting it. Thai cooks like their food to excite every area of your mouth so they mix sweet, salty, sour, and spicy hot, together in every meal. The ingredients for pad Thai can be somewhat intimidating. However, if you like authentic vegan Pad Thai, just like they make it in Thailand, I encourage you to use all the ingredients this recipe calls for. Tamarind is a sticky, very sour-tasting fruit that grows in large brown pods on the tamarind tree. Tamarind is usually sold as a paste, which is just the fruit separated from the pod and seeds of the tamarind tree. I usually buy it in Asian food stores, but you might have luck buying it in Indian food stores as well. The thickness and strength of tamarind paste vary, depending on the brand you use. So taste-test the pad Thai to achieve the right flavor. If you can’t get your hands on tamarind, substitute it with rice vinegar. Since tamarind is so sour, you’ll need some sweetener to get the perfect sweet-sour balance that Thai dishes are so famous for. Palm sugar has a nice caramel-like taste similar to natural molasses. Fish sauce is rich in glutamates that give food the meaty, savory flavor known as umami. One of the best plant-based sources of glutamates is seaweed and soy sauce. However, according to Cook’s Illustrated, they both fail to contribute sufficient depth. Therefore, glutamates need to be paired with flavor-boosting nucleotides found in dried shiitake mushrooms. Combining glutamates with nucleotides provide just the right meaty punch as a 1:1 substitute for fish sauce. If making your own fish sauce seems too time-consuming, you could substitute it with mushroom soy sauce. 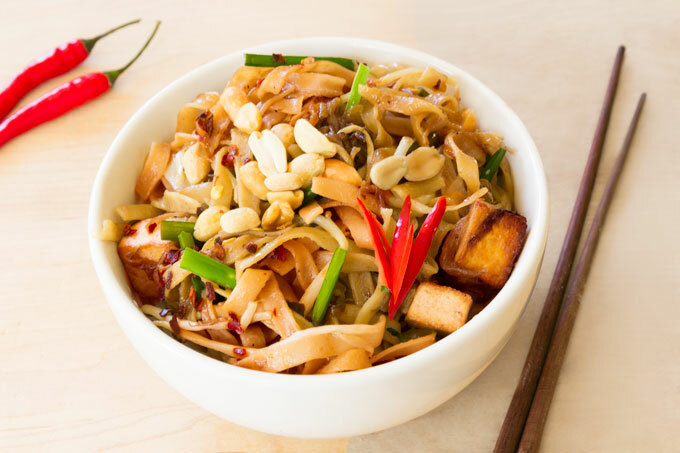 Rice noodles form the bulk of this vegan pad Thai. Some would even argue that rice noodles can make or break the dish. The noodles traditionally used in Pad Thai are thin and flat, sold dried most of the time. Pad Thai vendors always use Sen Lek that comes from Chanthaburi province. These noodles are made from freshly-milled rice flour and dried out in the sun the old-fashioned way (as opposed to machine-dried). They cook up nice and chewy, which is one of the marks of superior Pad Thai. Shallots have a distinctive garlic-onion taste, but lack the bite you get with yellow or white onions. They have a sweet and mild (although pronounced) flavor. If you don’t have shallots, you can substitute them with red onions or the white part of scallions with a touch of garlic. Chinese chives (also called garlic chives) resemble the more recognizable chives used as herbs. Regular chives are often eaten raw, sprinkled over the top of something, or added to sauces and dips. Chinese chives, on the other hand, are more substantial, taste garlicky, and are almost always cooked. Green onions or regular chives are a good substitute for Chinese chives. Bean sprouts – no soy bean sprouts, sunflower sprouts, alfalfa sprouts or other kind of sprouts. Mung bean sprouts only. They are crisp, slightly nutty, and hold up extremely well in stir-fries and pad Thais. Tofu is one of the foundation ingredients in a traditional pad Thai (and the perfect protein source for any vegan pad Thai). The original Pad Thai never had major meat as part of the ingredients because the Thais are not big meat eaters. Their diet consists mostly of vegetables and carbs, with a little bit of protein, mainly from eggs and small fish or shrimp. Pressed tofu is the best for a vegan pad Thai because it’s firm and withstands constant stirring. Ginger (very popular in Chinese cooking, but not Thai). Fresh chili peppers or chili paste (the Thai use dried chili peppers in this dish). Sriracha (the pink color typical for pad Thai comes from the red color in the dried shrimp, not Sriracha). Cilantro (commonly used in South Asian cuisine, but just not in traditional pad Thai). Sesame oil (more suitable for Korean or Chinese cuisine). Cabbage (perhaps if you’re making vegetable pad Thai, but not a traditional one). Prepare the pad Thai sauce first. Trust me on this one. Once you add the rice noodles into the wok, you won’t want to fiddle with the sauce. If you make the sauce first, you’ll be able to adjust the flavor without worrying about overcooking the noodles and burning the pad Thai in the pan. For pad Thai, you need to soak the rice noodles in lukewarm water until the noodles are pliable yet firm. The soaking time varies depending on the width of the noodles. For 1/8″ (3 mm) wide noodles, 20-30 minutes of soaking in a room temperature water should suffice. For 1/5″ (5 mm) wide noodles, I like to soak them for about an hour. If you use anything wider than 1/5″ (5 mm) – which I don’t recommend, the soaking method won’t apply and you’ll need to boil them in lots of water like pasta. Flavor – boiled noodles aren’t able to absorb as much of the flavoring liquid. Texture – rice noodles release a lot of starch in hot water. The result is pad Thai noodles that clump up and stick together. Many people shy away from tofu due to the monotonousness of the bland taste. However, in this dish, the tofu compliments the flavorful pad Thai sauce perfectly. The white spongy texture holds the Thai sauce so well that each bite becomes an addictive contrasts between the tofu and the spicy, sour and sweet sauce. I like to dry-fry the tofu because it adds a layer of crispiness and the tofu becomes beautifully golden brown. Don’t cook the bean sprouts and the Chinese chives. Add them right at the end, mixing them well with the noodles and all the other ingredients. The leftover heat will cook the vegetables and keep the noodles from overcooking. Toss them until the vegetables are soft. Authentic vegan pad Thai with savory-sour-sweet pad Thai sauce. 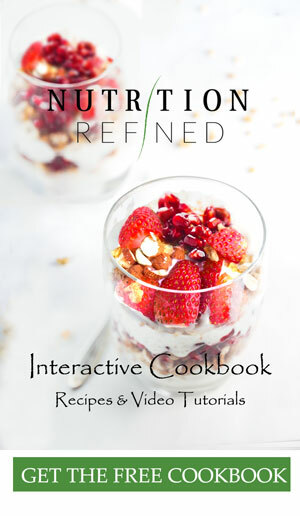 This recipe is healthy, yet very flavorful and satisfying. Begin by soaking the rice noodles in room-temperature water first. The noodles should be submerged in plenty of water. By the time you are ready to put ingredients in the pan, the noodles should be flexible, but not completely soft. When in doubt, under-soak. You can always cook the noodles in the pan later. Heat up a wok or cast-iron pan over high heat. Add the peanut oil, shallots, garlic, and tofu, and stir all the ingredients until fragrant and caramelized. Add the tamarind paste, palm sugar, and fish sauce. Stir again. Drain the rice noodles and add them to the pan. Stir quickly to keep things from sticking. The heat should remain high. If your pan isn't hot enough, you will see a lot of liquid in the wok at this point. Turn up the heat, if it is the case. The noodles should be now soft and chewy (not mushy). If they're still hard (under-cooked), add a little bit of water and continue to cook them. Add the Chinese chives and bean sprouts. Stir a few times until all the noodles and the vegetables are coated in the Thai sauce. Pour onto the serving plate and sprinkle with peanuts and dried chili pepper flakes. Serve hot with a wedge of lime, raw Chinese chives, and bean sprouts on top. Store leftover pad Thai covered in the refrigerator for 3-4 days. Combine wakame, garlic, peppercorns, soy sauce, shiitake mushrooms, and water in a large sauce pan and bring to a boil. Lower heat and simmer about 20 minutes (until the mixture is reduced and very salty). Strain and stir in the miso paste. Keep leftovers in the refrigerator. I made this dish this evening. The flavours were spot on, though I do wish I had an air fryer for the tofu my tofu was a little bland and soft not golden crispy as in your photograph. Great recipe. I had to use Kombu as I did not have any Wakame in house. Additionally I wanted to comment on the amount you suggested of seaweed. You mentioned a cup, but I noticed you put approximately 3 “leaves” of Wakame in the pan. How does that measure up to 1 cup? Please advise. I also loved the Chinese Chives (authentic) I bought from the Asian store, interesting flavor. Thanks for a great recipe. So sorry about that – I typically use between 10 g to 15 g seaweed, which is about 1/8 cup. I just corrected the recipe (thank you for catching that). There are three factors that play a role in how crispy your tofu turns out: 1. how firm the tofu is (anything less than extra firm won’t crisp up properly); 2. the moisture content (some brands contain more water than others. If your tofu didn’t crisp up, i would recommend setting something heavy on top of the tofu for about 10 minutes to press out any extra moisture); 3. sauteing the tofu over high temperature (make sure your skillet is set on high). Let me know if you have any questions.